When people see our dogs, or us out with our dogs, the First Question We Are Always Asked: Do You Have Puppies For Sale? 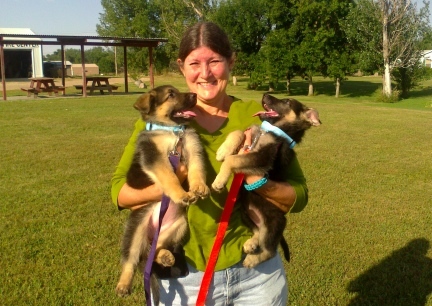 Are You German Shepherd Dog Breeders? Scroll Down on this page, as well each of the pages on our website to see many many photos of our dogs (some no longer with us). Thanks for visiting our site. WHAT IS A WORKING DOG? HAVE A LOOK AROUND OUR WEBSITE TO SEE THE JOBS YOU CAN TEACH YOUR OWN DOGS. 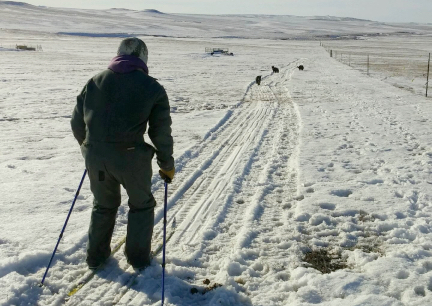 OUR DOGS ARE NOT JUST OUR PETS AND CONSTANT COMPANIONS, THEY ARE WORKING DOGS OUT OF GREAT LINES. As soon as our dogs are 8 weeks old, actually before that age if born here, but with their mother near by, or when a new dog arrives at our Kennel, they start training. What kind of training? 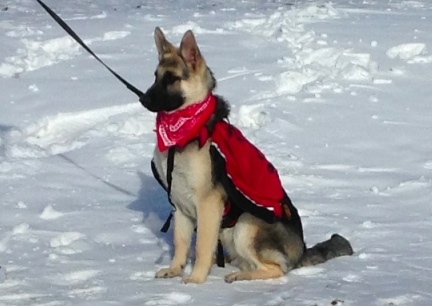 We start with leash and manner training, add a few tricks and a bit of agility, and go from there. Our dogs are not just great Farm Dogs, they know all sorts of important and fun things. 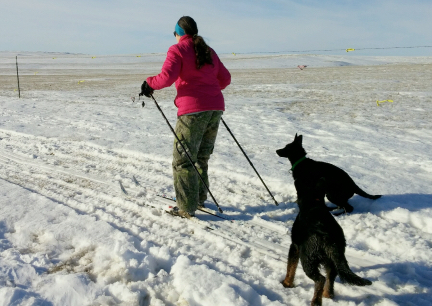 Our dogs LOVE to join us for Backpacking and can pull a sled...and that is just for starters. Have a look around our website to learn more about our dogs and training. 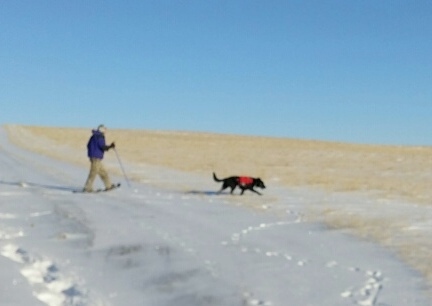 We teach our dogs as pups to carry light weight Dog Backpacks here in NW South Dakota. We do this to get them used to the feel of the pack and straps as they walk about, and to also get used to hearing the Backpack on their backs. They will be able to carry Light Loads, but will not really be able to carry too much until they are about 2 years old. 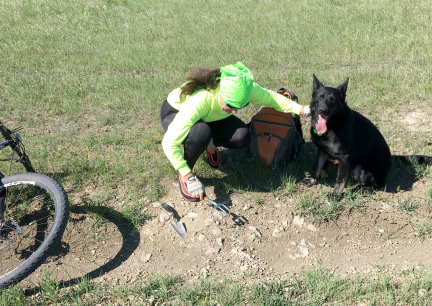 Photos of Deron with Tekoa, and Titus in the Red Dog Backpack. If you look, you will see we own different types of backpacks. The M.O.L.L.E. 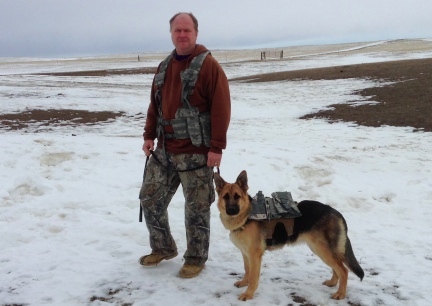 Dog Vest that holds smaller packs is new to us. 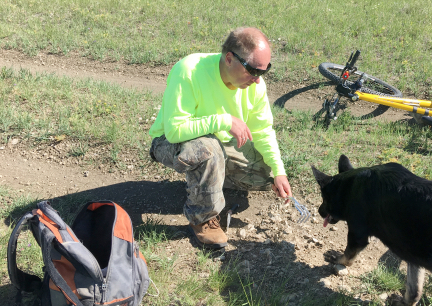 If you would like to read more about Backpacking With Your Dog(s), be sure to see our Backpacking Page here at this site. 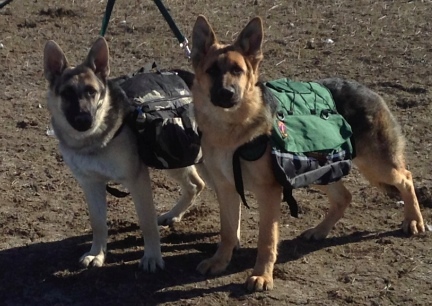 We are tying to get many, fun, short trips with an empty or light weight backpack on our dogs for training. Have fun, let the dogs have a good time too....and get photos. Lots of photos. Dogs and people grow old quickly and are gone too soon. You will be so thankful for those photos for years to come. 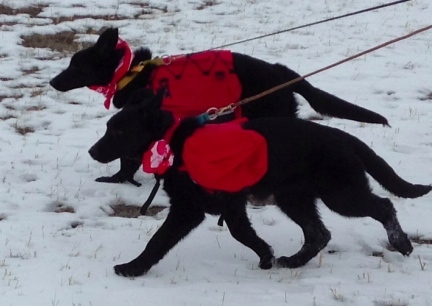 These photos are of Marna with Tekoa and Texas Tea in their new Blue Dog Backpacks, each is empty. These photos were taken at the Center of the Nation in Belle Fourche, SD, 2014-02-19. German Shepherd Dogs were bred for and to work. I have not seen a Dog Sport yet, old or new, not any dog sport, that a German Shepherd has not excelled in. German Shepherd Dogs (GSD or GSDs) are a beautiful in motion. 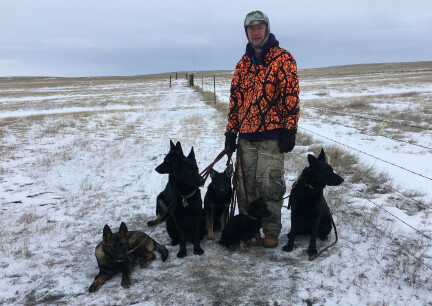 When bred correctly, with the correct body style, these dogs have and do herd animals, keep us safe working with Police and the Military, Lead the Blind, Move Beautifully in the Conformational Show Ring, as well as move out fast and run with ease over Agility Equipment. 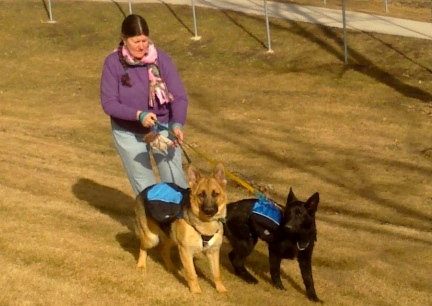 German Shepherd Dogs (GSD or GSDs) enjoy all sorts for Dog Sorts with their people. They compete at jumping up and grabbing Frisbees as well as being a Dance Partner for their owner. These dogs run fast and maneuver over Agility Equipment and leap/dive far in Diving Dog Competitions. 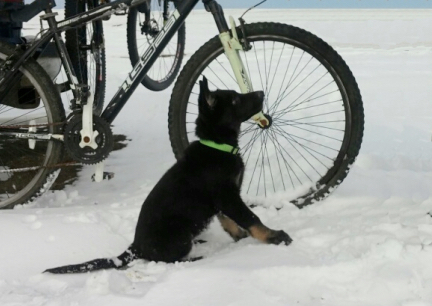 I was not the first, nor will I be the only or the last to have my GSDs pull me in wagons, on rigs and sleds, and scooters. 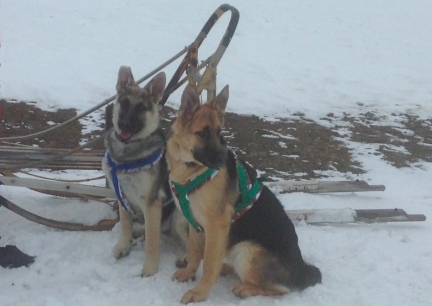 Yes, GSD's are even Sled Dogs and so much more! "A working dog is one belonging to a breed that is physically and mentally capable of carrying out a particular duties. Included in the classification of working dogs are many breed that are not longer required to perform the functions for which they were intended. The German Shepherd Dog, however, since it was first developed, has continued to serve mankind in many capacities." Other and many of the German Shepherd Dog books remind us, and this is true of so many breeds of dogs, The Dogs Are Better Off, or This Breed Of Dog Does Best IF It Has A Job, or Truly A Working Breed This Dog Will Be A Better Family Member IF It Has A Job. The German Shepherd Dog was bred as a Working Dog above all. When they were needed less because of less need of them for Shepherding work, it was the "Father of the Breed", Captain Max von Stephanitz, that campaigned them into Police Work, even beyond the laughter and opposition. You know he succeeded in this feat and the world is better off because of it. It was not long before the world also figured out all the other types of work this dog breed would become known for. The book I quoted is one of about all the GSD Books that remind us that above all, the German Shepherd dog is a working dog. If you are buying a GSD as a Working Dog you will want a dog that is bred in what is now called the "Classic" or "Original" "Old Style". The Classic or Original, or Old Style GSDs are bred the way that that Captain Max von Stephanitz saw the dogs should be built for work. These dogs have straighter backs, stand more square/rectangle, do not have "roach backs", have a bit more bone to them. 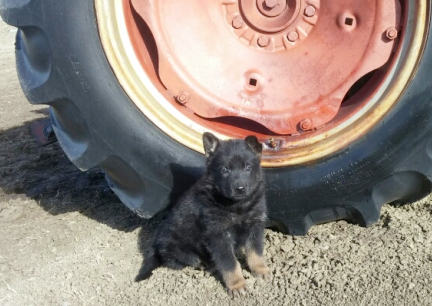 This is the type of GSD you will want to own for most jobs. That is, unless you are showing in the Conformational Show Ring. Then, to win, you need the slanted back dogs. Does Size Matter? HEALTH Matters, a Good Genetic Foundation Matters, The Diet the Dog Was or Will Be Raise and Maintained On Matters, Training Matters, Conditioning Matters, Flooring Matters for a Growing Puppy as well as a Dog, Size? Size only matters to that person that prefers the size dog they bought, it only matters to the one who owns and works their dog. I ask, to the question, "Does size matter?" ~ Matter for what? The Standard for the breed calls for the male GSD to be between 24" - 26". Females, in the Standard are to be between 22" - 24"....so yes, if you want a GSD that is within the Standard for the Breed, size does matter. If you own a GSD or are thinking about buying one remember that this dog will count on you for care, a good diet and some sort of job, or at least time out playing or jogging or walking with you. The GSD is an intelligent and active dog, one that was created for work. A breed of dog that will instinctively guard you and your family as well as your property. Live up to the responsibility it is to care for such a great dog. 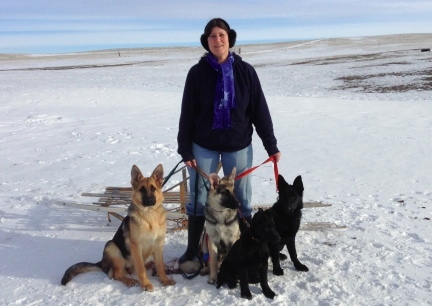 I invite you to take a look around this website for ideas of fun activities you and your GSD can participate in. Keep in mind. 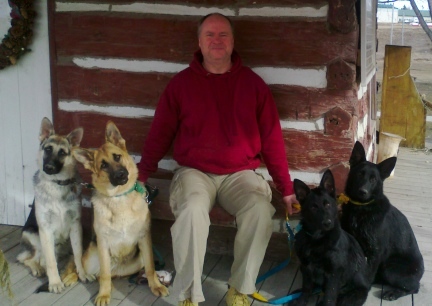 Those well behaved, gorgeous German Shepherd Dogs that you see out and about with their owners. Maybe you saw them at a Dog Sport or an Event on Television or on a Video on the Internet. At any rate, that beautiful dog that is well behaved did NOT just happen. That owner has a lot of money, in care, veterinarian and food and such, as well as many hours of training at the other end of that leash. If this is what your want, a really nice looking well behaved German Shepherd Dog, be prepared to spend the money and time it takes. 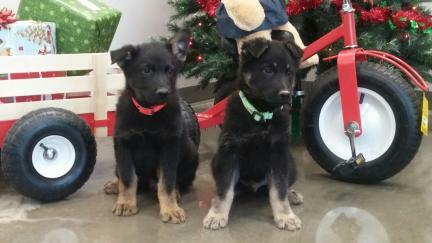 German Shepherd Dogs are puppies for 2 years...at least. There is a lot of energy within them. They need a job and a lot of toys and things to do before they reach that adulthood. Be prepared to spend the time with them, and on them that it takes for them to become a wonderful dog that others will compliment you on. 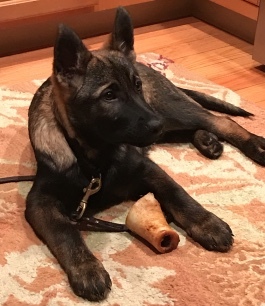 Please continue to read our website and be sure to read The Picking Out Puppy page, Do Your Homework page, as well as the Training A GSD page before you decide that this is the breed for you. 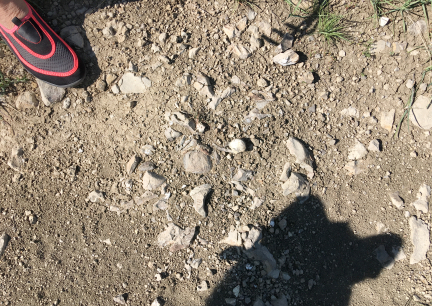 This photo was taken at the same place as the photo just above it, they were taken at the Center of the Nation Museum in Belle Fourche, SD. Again, Deron with Titus and Tekoa and on the other side, Turquoise and Texas Tea. Photo was taken 2014-02-19. This was taken the day Tikuah arrived in South Dakota to us from Grand Rapids, MI, 2017-01-20. We met the shipper at the Museum and I asked Deron to please pose here again with a GSD. They had removed the bench, so Deron got down next to Tikuah for another of my favorite photos! THE T TEAM ASSEMBLES FOR THE FIRST TIME 01-07-2014! SOON, VERY SOON, THE FIVE OF US WILL BE A TEAM AND OFF DOWN THE TRAILS WE SHALL RUN! I HAVE A LOT OF TRAINING TO DO BETWEEN NOW AND THEN. OUR DOGS LOVE TO BE WITH US AND WE LOVE TO BE WITH THEM! 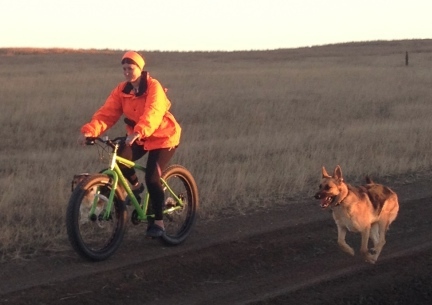 OUR DOGS LOVE THAT WE HAVE AN ACTIVE LIFE STYLE AND THEY LOVE TO BE PART OF THAT LIFESTYLE! 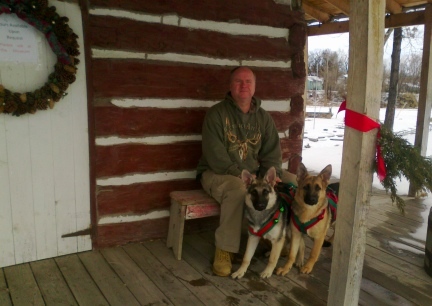 DERON AND I MET WHEN WE WERE RACING SLED DOGS, AND WE ARE STILL ENJOY WINTER SPORTS WITH OUR DOGS. 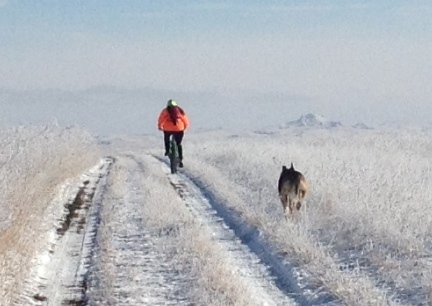 WE OFTEN TAKE OUR DOGS FOR MORNING WALKS HERE ON OUR PROPERTY. IT IS GOOD TRAINING. The dogs have a 'place' in the line up and they are to stay in it. It gives them more of a 'meaning' or feeling of working, and it seems more like a 'thing' to them if they are expected to do something as they go.....like "EASY!" (not pulling on us, but keeping the leash tight), "Line Tight" to not have slacking (but not pulling) that someone could trip on or tangle in, and "Your Side", placement if they get out of line. "On By", don't stop, don't go left or right, and DON'T pick up the horse poop!. "Drop It", you can guess what 'it' it. "Whoa".....stop and stand right there....usually when one stops to potty the others are to stand in line and wait. "Haw" left turns....and "Gee" right, but we go around to the left. "STOP! ", they know to stop whatever bad behavior they are 'performing' at the time. <laughs> And. 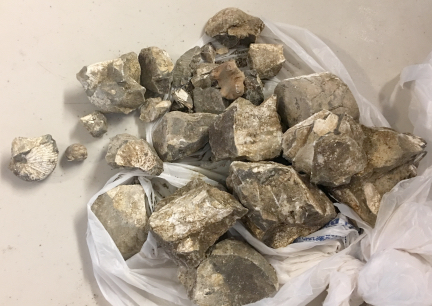 When we get back, after Deron and I get leashes put away and coats off, they are suppose to keep sitting and wait for this, they get a big cookie and a 'good dog' (large milk bone type treat).....they love it! AND JUST FOR THE FUN OF IT, OUR DOGS DO A FEW TRICKS....SEVERAL ACTUALLY. HAVE A LOOK AT OUR TRICK TRAINING PAGE HERE AT THIS SITE TOO...FUN THINGS YOU CAN LEARN TO DO WITH YOUR OWN DOG. TYCHICUS RAY VON KAZMAIER ~ The New Sheriff At Our Place! 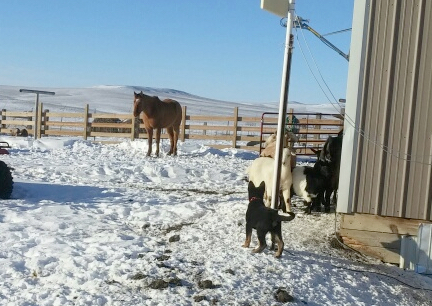 We bred Titus and Turquoise so that we could keep a male (neutered) to become our new Full Time Farm/Ranch Dog here in NW SD. We will be training THIS Boy to do many things. Some of the Farm/Ranch Jobs....he will just know, it is "in his blood". Tychicus has a pedigree you can follow ALL THE WAY BACK to the 1800's when the breed began! KAZMAIER'S TABALIAH THE GATEKEEPER ~ The New Bicycle Shadow! She moved here from FL and loves her little Alligator Squeaky Toy! she received for Christmas 2016. She also LOVES the snow. Tabaliah has a very impressive pedigree back to the 1800's when the breed began. 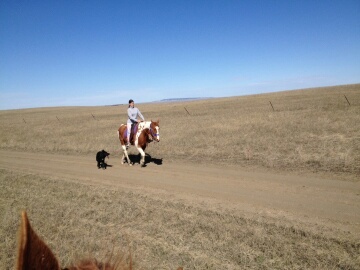 Tabaliah is and will learn many things here in NW SD. She is slated to take over where Tekoa left off...and run with me as I ride my bicycle here on the Prairie as well as join us for many other adventures and backpacking trips. Teanna Von Kazmaier is from our own breeding between Titus and Texas Tea. 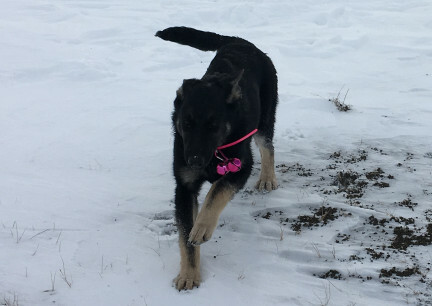 Indications are showing that Teanna should 'finish' as nice as her mother, Texas Tea....who is very close to the GSD Standard for the Breed. 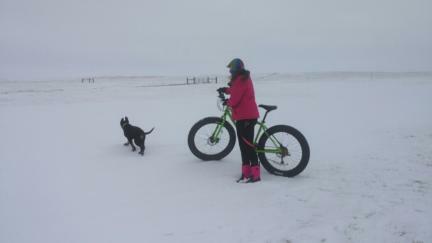 This is 5 month old Teanna out running around here with us on our Fat Bikes. Note her Bells. We did not go far, but she LOVED it. She took a good nap after. VON KAZMAIER'S TIKUAH DER AUFSEHER came to us from MI and is (that is will be when old enough if health checks out well) our new Sire here at Von Kazmaier Kennel. Tikuah has a HUGE BIG DEAL PEDIGREE, and better, HE IS A GREAT AND FUN TO BE AROUND PUP! You can see Tikuah's Pedigree Link on his own page here at this site. Also note that Tikuah's Grandmother was a Seiger Winner! To see Far More Photos of Tikuah, as well as Information and his Pedigree, PLEASE take a minute and Visit Tikuah's page here on this website. 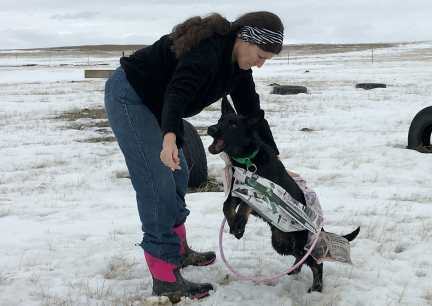 Don't Miss our own GSD Sled Dog Training Diary on the Sled Dog Page, Scroll to the bottom of the page to see photos and information of how we train our own dogs to become sled dogs. The contents of this page for Front Page as well as some of the other pages are still under construction, HOWEVER! Have a look around, many of the pages are coming together well. If there are pages with information you are interested in Please check back. 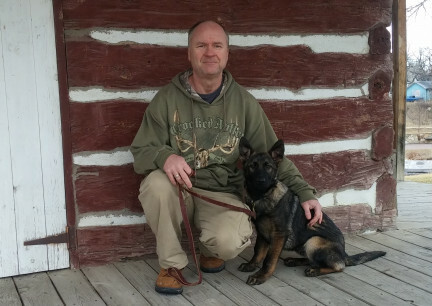 PLEASE VISIT OUR MANY PAGES HERE ON THIS SITE WITH INFORMATION ON WORKING GERMAN SHEPHERD DOGS AS WELL AS IDEAS AND TRAINING PAGES. 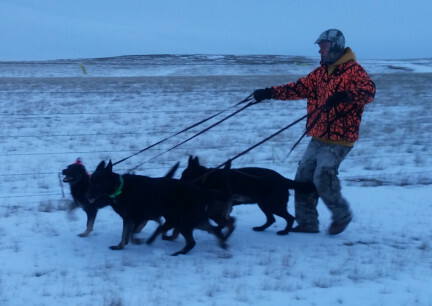 WE KNOW WE HAVE NOT COVERED EVERY JOB OR SPORT THESE DOGS PARTICIPATE IN. 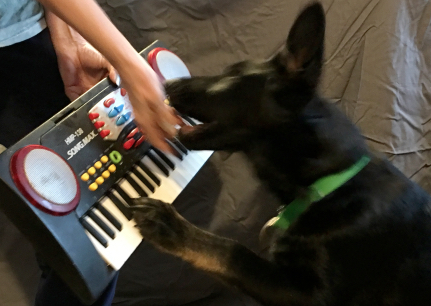 WE DID TRY TO COVER SOME THAT THE AVERAGE PERSON WAS NOT AWARE A GSD WOULD/COULD/DO EXCEL ENJOYING.